Most Latin American countries became independent from Spain at the beginning of the 19th century. This happened through declarations of independence for areas similar but not identical to current geographical arrangements or for larger territories, comprising several current countries that later separated into the countries we know today. Instances of the latter are the Federal Republic of Central America (1821) [Costa Rica, El Salvador, Guatemala, Honduras and Nicaragua] and The Republic of Gran Colombia (1821) [Colombia, Ecuador, Panama, Venezuela]. Instances of the former are Haiti (1804); Bolivia (1825); Brazil (1822); Chile (1818); Mexico (1810); Paraguay (1811); Peru (1821); and Uruguay (1825). Yet, Cuba did not manage to become independent until 1902 although its declaration of independence can be placed as early as October 10, 1868. This date marks the start of the first war for independence (Ten Years War) and the event itself is associated with the abolition of slavery. On this date the liberation of his slaves by Carlos Manuel de Céspedes is one of the first acts at La Demajagua sugar mill upon declaring independence. While this association between independence and the abolition of slavery may have been one reason for the difference in the timing of independence between Cuba and other Latin American countries, it is somewhat inconsistent with the events of the time as a primary or sole explanation. Many of the Latin American countries that became independent in the first quarter of the 19th century did not abolish slavery until later, sometimes much later. In several the lag was short, less than ten years, e.g., Federal Republic of Central America (1824), Chile (1823), and Bolivia (1831). In others, however, the lag was much longer, e.g., Uruguay (1842), Colombia (1851), Venezuela (1853), and Brazil (1888). Of course, a similar long lag applies to the United States where independence from Britain takes place in 1776 and slavery is abolished in 1863. Along the same lines, simple economic explanations for the differential timing of Cuba’s independence do not fare too well when confronted with the facts if one views independence as a normal good, i.e., one for which the demand rises with income. If we consider the economic circumstances at the time of Latin American independence movements, let us say the first quarter of the 19th century, we find that Cuba was economically advanced relative to the other colonies and even to the United States. For instance, John Coatsworth (1998, Table 1.1) presents estimates for Cuba in 1800 of a per capita income of 112% relative to the U.S. at that time and higher than any other Latin American country. Argentina, the next highest country in Coatsworth’s table, was estimated to have a per capita income in 1800 of 102% relative to the U.S. Incidentally, Argentina gained its independence in 1816 and abolished slavery in 1853. He describes “autonomistas” as reform-minded individuals seeking greater autonomy for local decision making while pledging allegiance to the Spanish Crown. The “anexionistas” he describes as individuals convinced that Cuba’s interests were better served within the American Union. Finally, he describes the “independentistas” as individuals committed to the creation of a republic similar to the ones conceived by Bolivar for Latin America. A broader characterization of the “autonomistas” is that of individuals committed to the view that Cuba and Spain had a “special relation” that called for a different type of arrangement than either a typical “subjugated” colony or a “fully” independent state. The role of these individuals between 1790 and the late 1820s in Cuba is the basis of this third explanation for the differential timing of Cuba’s independence. A narrower, less complimentary, characterization of the “autonomistas” during this period is as the plantation or sugar oligarchy, i.e., the “plantocracia” or the “sacarocracia” (Moreno Fraginals 1995, p.146). This narrower view provides a simple version of this third explanation: Namely, the plantation or sugar oligarchy prevented independence. Finally, a more nuanced view of the “autonomistas,” provided in correspondence from Carlos Quijano, notes their evolution from espousing local or provincial self-government during this period to espousing self-government for the whole island as part of the Spanish nation immediately afterwards to full independence in the 1870s. In order to understand the “autonomistas” views as well as in assessing the role of economic considerations and slavery on independence and democracy, it is useful to be clear on what we mean by democracy. A recent paper by Betancourt (2010) argues that democracy is conceived in terms of three dimensions—political rights, civil liberties and legitimacy—that interact with each other. He also argues that legitimacy, in particular, is quite sensitive to context in terms of time and place. Thus, it is desirable to explore what these concepts meant at the beginning of the 19th century. For, they would have affected the interplay between these three explanations of the differential timing of Cuban independence. Moreover, they would also affect the relationship between independence and democracy. These two terms are not synonyms even now, and they were much less so at the beginning of the 19th century. In sum we hope to enhance understanding of two issues in this brief essay. First, what were the factors that determined Cuba’s failure to become independent at the beginning of the 19th century? Second, what was the relation of these factors to the process of democratization in Cuba at the time? In order to do so we will proceed in the following manner. In the next section a framework developed for the analysis of modern democracies is presented and adapted to the circumstances of the early 19th century. Subsequent sections use this framework to gain new insights on the three issues potentially relevant for answering the two question identified above. In particular, we consider the “special relation” with Spain, the role of slavery and the economic conditions of the time. A brief conclusion provides an overall perspective on the answers to these questions. It is common place now-a-day to conceive of democracy in terms of the dimension of political rights. Sometimes this dimension is reduced to the holding of free or fair elections, which is certainly an essential aspect of the political rights we associate with democracy. Sometimes this dimension is reduced to constraints on the arbitrary power of the executive through either internal checks and balances on its power, or the extent and competitiveness of participation in the political process or the degree of accountability and transparency of policies. Indeed, there are different indexes designed to measure this dimension of democracy, e.g., the Freedom House Political Rights Index, or aspects of this dimension of democracy, e.g., the Polity IV Constraints on the Executive measure. Similarly, it is also fairly common now-a-day to view civil liberties as an integral or defining dimension of democracy. Sometimes we refer to these liberties as human rights. Originally, they included individual rights guaranteed in most countries’ constitutions, for example freedom of speech and freedom of assembly, and more generally some form of rule of law protection for individuals. These are often called first generation human rights. Today, these liberties also encompass the protection of individuals’ rights to improve their well being through their ownership of property, their mobility with respect to location, housing, education and employment, as well as social freedoms, for example marrying whom you want. These rights are often called second generation human rights. Just as in the case of political rights, there are different indexes designed to measure this dimension, e.g., the Freedom House Civil Liberties Index, or selected aspects of this dimension, such as the Economic Freedom Index put out by the Fraser Institute. Less common place in some circles is associating the notion of democracy with legitimacy. Yet in political science the legitimacy or illegitimacy of forms of governments is such a common place concept that many writers use the term without defining what they mean. To prevent confusion, by legitimacy I mean the willingness of the governed to accept the right of those who govern them to do so. Furthermore, just as most basic institutional concepts, it has two aspects: a de jure aspect and a de facto aspect. Thus, democracy is by definition legitimate from the de jure point of view when power is attained through an electoral process perceived as free and fair. Yet, even if this condition is satisfied de facto legitimacy can be lost due to the performance of the elected officials. For instance, if elected officials engage in rampant corruption, violations of fundamental rights or failure to provide basic public goods that a society has come to expect (law and order for example), a democratic government can easily become illegitimate from the de facto point of view. While this may seem far fetched in stable, democratic developed countries, it is far more likely in less stable democracies in developing countries. One can find examples of countries where governments lose their legitimacy as a result of becoming failed states despite having democratically-elected governments. Indeed, it is not far off to characterize both Iraq and Afghanistan as subject to a high level of that risk at present, or to characterize the democratically-elected governments in Venezuela prior to Chávez as having lost their de facto legitimacy through corruption, among other things. In projecting these concepts back into the New World at the beginning of the early 19th century, we have to consider how these dimensions would have been viewed at the time by those involved. For this task it is useful to start by thinking of democracy as a process, following Tilly (2007), and of a regime as democratic “…to the degree that political relations between the state and its citizens feature broad, equal, protected and mutually binding consultations” (p. 14). An additional category in describing a regime is noted by Tilly (p.15), i.e., the state’s capacity to enforce its political decisions. These five categories are only partly independent. They also map into the three modern dimensions identified before but not on a one-to-one basis. Their usefulness lies in two factors: often it is easier to relate them directly to the conditions prevailing at the beginning of the 19th century and to characterize their evolution as indicating movements toward democratization or de-democratization. Breadth relates to the extent of citizenship rights enjoyed by households in a society. Equality refers to the differences in rights enjoyed by different groups in a society as well as within these groups. Breadth and equality correspond most closely to what we have called political rights. Protection refers to protection against arbitrary action by the state. Mutually- binding consultation implies a well defined set of rights and obligations for both agents of the state and categories of citizens. Protection and mutually-binding consultation correspond most closely to what we have called civil liberties. Legitimacy includes the state’s capacity to enforce its political decisions with respect to these categories but also the extent to which the degree of breadth, equality, protection and mutually-binding consultation in a regime is consistent with the expectations of the population on these matters. Many factors affect the development of this relationship, ranging from location and geography to historical circumstances in Cuba and the rest of the world. But the main elements are not the subject of much dispute. Cuba’s location at the entrance of the Caribbean and its easily accessible natural harbors by 1790 had made it a critical entry and exit point for Spain’s military and commercial relations with the New World. A key event in this development was the occupation of Havana by the British in 1762. For a variety of reasons, after Havana’s return to Spain in 1763, there were a number of changes in Cuba’s interactions with Spain in the commercial and military realm that were either not experienced by other colonies to the same extent or introduced later (Piqueras Arenas 2009, pp. 273–277). For instance, island residents were encouraged to form their own local military units. Of course, they had to pay for their maintenance locally as well. In Cuba’s case this led to a local army of 7,500 soldiers (Moreno Fraginals 1995, p. 138) that could supplement and be integrated with the Spanish troops from the peninsula in maintaining the empire. In exchange Cuba could engage in free commerce with several Spanish ports as well as with the 13 colonies. One of the longer term effects of these reforms was that between the end of the 18th century and the first three decades of the 19th century, Cuban criollos ended up holding high-ranking positions in the Spanish army, including coronels, generals, and even a Minister of War (Moreno Fraginals 1995, p. 139). 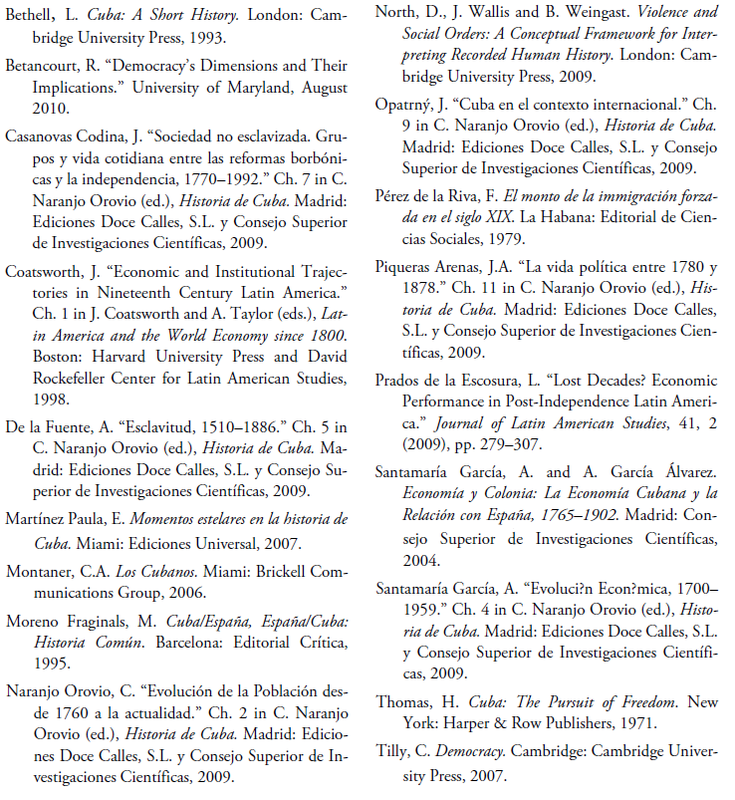 Similarly, during the period between the English occupation of Havana and 1830, Cuban criollos negotiated more than 50 Spanish nobility titles (Moreno Fraginals 1995, p. 141). It has been pointed out (by Carlos Quijano) that other Latin American countries had individuals with similar colonial links to Spain as Cuba’s , e.g., San Martín fought as a Spanish officer against the French, and with respect to the U.S. and Britain, George Washington named his farm Mount Vernon in honor of an admiral of the British fleet where his brother was an officer. Thus, this aspect of the argument for a special relation assumes that the number of officers and the ranks attained by these officers as well as titles dominate those of other countries relative to some norm. Influenced by the American revolution, English economic ideas on free commerce and similar organizations generated by the Enlightenment in Spain, the leading “autonomista” of the period, Francisco Arango y Parreño, founded the Sociedad Económica Patriótica de Amigos del País in 1787 (Montaner 2006). This organization was devoted to the promotion of ideas and knowledge that would improve agricultural and industrial production, promote trade and education of elites and masses as well as the printing press and policies that would improve efficiency of government. While the American Revolution’s stress on civil liberties and the rule of law (at least for some privileged members of society) must have been attractive to “autonomistas,” since many of them belonged to the Cuban elite and were property owners, the French Revolution must have been more of a mixed bag from their point of view. Liberty, equality and fraternity might have sounded attractive intellectually to some of them in 1789, but the successful armed struggle in Haiti, culminating in independence in 1804, must have been a sobering episode. The latter had dramatic negative consequences for the welfare of the white minority population of Haiti as well as for many non-whites that had adopted French ways. Some of the “autonomistas” were coffee planters (Moreno Fraginals 1995, p. 146). Many coffee planters that survived Haiti’s independence struggle migrated to Cuba’s eastern provinces with their tales of horrors (Montaner 2006, p. 62). While Cuba’s black and slave population at the time was a much smaller proportion of the total than Haiti’s, which was well over 90% (Thomas 1971, p. 75), it was still substantial as we shall see below. The Haitian example must have generated much uncertainty about what independence could bring to Cuba. Thus, it would have increased the enthusiasm for the special relation in many individuals, including some for whom independence may have seemed an attractive alternative otherwise. The special relation and continued association with Spain embedded in the “autonomistas” position would have provided a less uncertain alternative than full independence for many individuals. An important factor in the development of this special relation after the occupation of Havana by the British was the weakness of Spain’s monarchy in terms of resources for financing the protection of the empire and its obvious vulnerability at least with respect to Cuba. A similar situation of weakness on the part of Spain as a colonial power at the beginning of the 19th century led to the development of further links in this special relation as well as to the successful struggle for independence in many of the other colonies. Napoleon invaded Spain in 1808. The invasion created strange bedfellows in defense of the Spanish monarchy as well as attempts to get rid of it altogether by some of the colonies. Some defenders supported the Spanish monarchy as it had been. It was the French they objected to. Others were influenced by the ideas of the French Revolution and supported a modified Spanish monarchy: namely, one constitutionally constrained to prevent the abuses of absolutism. Others, including many in the colonies, preferred doing away with the monarchy altogether. This invasion generated a period of instability in Spain and its relation to the colonies that ended in 1824 with Spain’s conclusive defeat in the New World (Montaner 2006). One particular episode during this period highlights the special relation between Cuba and Spain, las Cortes de Cádiz. This was a constitutional convention in Cádiz, Spain, that began in 1810 and aimed to circumscribe the power of the monarchy and guarantee individual rights. Representatives from the colonies were invited and Cuba had three representatives. A constitution was finally adopted in 1812. A proposal to abolish the slave trade was considered and rejected due to the opposition of the Cuban representatives. This proposal was controversial, giving rise to broad participation by other representatives for and against the Cuban position. On the positive side, for example, the highest Spanish authority in Cuba, Captain General Someruelos, wrote a letter in support of the Cuban status quo slavery position, highlighting Cuba’s tranquility and economic contribution to Spain (Piqueras Arenas 2009, p. 280). On the negative side, for example, all other representatives from the colonies opposed the Cuban position and supported the proposal for abolition of the slave trade (Moreno Fraginals 1995, p. 161). Not every one in Cuba was attracted to the special relationship with Spain after 1808. At least two exceptions are labeled “stellar moments in Cuba’s history” (Martínez Paula 2007, pp. 77–78). The first one is an attempt at independence in 1809 by Román de la Luz Silvera, a wealthy member of the Havana oligarchy, who sponsored the writing of a Cuban constitution by the lawyer Joaquín Infante. This constitution was to be the basis for an independent state that accepted slavery “as long as it was necessary.” The sponsor was condemned to ten years in prison and permanent expatriation and the lawyer escaped to Venezuela. The second one was a set of attempts by Cuba’s black population toward insurrection around 1811. Initial attempts occurred at individual sugar mills but without co-ordination or well organized leadership. In this context José Antonio Aponte, a free black man from Havana, emerged as a leader and organized uprisings in various places in the island. These uprisings were suppressed mercilessly and Aponte was hung in April of 1812. Another alternative that emerges formally at this time is annexation to the United States through purchase proposals. President Jefferson sent an emissary to Someruelos in 1809 proposing purchasing Cuba if Spain could not maintain its presence in the island (Thomas 1971, p. 179). Nothing came of the offer. While Spain’s weakness as a colonial power is one important factor in the development of the special relationship, the economic power of the Cuban criollo class, which includes a much broader group than just the sugar planters, is an equally important factor. For instance, between 1815 and 1819 (after the return of absolutism to Spain in 1814) the Cuban criollo class obtained five measures quite favorable to their economic interests from the Spanish Crown (Piqueras Arenas 2009, p. 282). These measures are: (1) free exploitation of forest resources and a favorable resolution of a legal claim against the Spanish Navy (1815); (2) elimination of the tobacco monopoly by the crown (1817); (3) free trade with other countries (1817), basically consolidating 25 years of earlier measures and informal activities; (4) the ability to hold, use and transact property previously held in common by private individuals (1819); and (5) the recognition of the validity of land grants by the Crown and municipalities prior to 1729, of transactions that allowed the transformation of cattle ranches into sugar mills, and of the property rights of those occupying royal lands over the previous 40 years (1819). In sum, the special relation allowed the Cuban criollo class, not only the sugar planters, to protect their economic interests whether the prevailing winds in Spain were being blown by Spanish liberals in the Cortes or by the Spanish Crown during this critical period in Spanish history. Moreover, this process itself strengthened the nature of the special relation. For, Cuba was the first landing point in the New World for Spanish troops coming from Europe to try to suppress the insurrections in the rest of Latin America. It was also the place to which they retreated after their defeats (Moreno Fraginals 1995, p. 167). We are now in a position to view these events associated with the special relation in terms of what they may imply for democracy at the time. This period can be characterized as one of democratization in terms of civil liberties, at least for whites and free non-whites. In particular, the five reforms illustrating the economic power of the Cuban criollo class, which come toward the end of this period under absolutism, all point in the direction of codifying protection and mutually-binding consultation against the arbitrary power of the state. They imply a well defined set of rights and obligations for both agents of the state and a large subset of subjects of the state, especially in the economic sphere. Hence, on these dimensions one must conclude that Cuba experienced a substantial democratization process between1790 and the 1820s despite its failure to become independent. When we come to political rights or the breadth and equality of “citizenship” rights, however, one is usually speaking of the breadth and equality of the rights of Crown subjects. There certainly were substantial inequalities in the breadth and equality of rights enjoyed by different groups. The most important one is, of course, between slaves on one side and whites and free non-whites on the other side. The inequalities between the political rights of slaves and the rest of society certainly increased during this period. On paper the new slave code of 1789, the Spanish Code Noir, was more enlightened than any other slave code of the time, but it was not even promulgated in Cuba on appeal from the slave owners because it would encourage dangerous attitudes (Thomas 1971, p. 74). Thus, the breadth and equality of political rights of the slave population decreased during this period, leading to de-democratization on this dimension. It is likely that this would not have happened if Cuba had become independent, but it is by no means certain. Last but not least we come to the issue of legitimacy and state capacity. The weakness of the Spanish state during this period limited its capacity to provide its subjects with secure political and economic rights regardless of whether these rights were the limited ones available to subjects of an absolute monarchy or the broader ones of citizens of a constitutional monarchy. In this vacuum of power different groups in society fared very differently. While whites and free non-whites may have enjoyed more civil liberties and political rights in practice than they would have had otherwise, slaves enjoyed fewer ones as a result. Slaves did not view the situation as legitimate, which is illustrated by their many revolts during this period. Furthermore, many criollo non-slaves (both white and non-white) did not view the situation as legitimate either. This is illustrated by the attempts at independence during this period mentioned above and the more numerous subsequent ones, for example the Rayos y Soles de Bolívar conspiracy that started as early as 1821 (Martínez Paula 2007, p. 83). In fact, even the more sophisticated “autonomistas” had difficulty in legitimizing a setting where slavery was an integral part of the system. This is illustrated by a convoluted argument of Arango y Parreño opposing the abolition of the slave trade in the Cortes de Cádiz (Moreno Fraginals, 1995, p. 162). It resembles an explanation of how many angels can dance on the head of a pin or of the meaning of the word “is”! We have already discussed some aspects of slavery during this period in the previous section. There we concentrated on those aspects relevant to the special relation between Cuba and Spain. Here we will focus on the role of slavery per se in Cuban society during this period. We discuss first the “facts” about slavery in terms of population numbers and subsequently the evolution and characteristics of the system. Between 1790 and 1820 there was a substantial increase in Cuba’s population as well as a dramatic change in its composition. The annual rate of growth of the total population was about 2.9%, but this was made up of a low of 2.4% for whites, a high of 3.5% for slaves and an average of 2.9% for free non-whites, mainly blacks and mulattoes. Hence, during this period there was a substantial decrease in the percentage of whites in the population, to about 43%, and a substantial increase in the percentage of slaves in the population, to about 36%. The percentage of free non-whites remained about the same, around 20 to 21%. Table 1 presents the relevant available information for the period as well as for prior and subsequent years for perspective. It is an adaptation by the author from the original source (Naranjo Orovio 2009, pp. 31–32). Table 1 reveals that Cuba’s demographic evolution between 1790 and 1820 reflects an acceleration of a process started before 1790 and that the main elements of this process continued beyond 1820. This evolution was substantially affected by the importation of African slaves. The period 1815–1819 is the five-year period with the greatest percentage increase in the importation of African slaves in Cuba’s history, well over 100%. The flow of imported slaves went from about 30,000 in the previous five year period to over 100,000 (Pérez de la Riva 1979, pp. 41–44). These numbers are not surprising in light of the Spanish agreement with the British to abolish the slave trade with a three-year grace period in 1817 (Thomas 1971, p. 94). These overall changes in the composition of the population nationwide were even more marked in certain geographical areas for historical and economic reasons. Most of the non-white population, both free and slave, was concentrated in the western and eastern areas due to the importance of slaves in the production of sugar (western region centered around Havana) and coffee (eastern region nearest Haiti). Cattle ranching, which hardly used slaves, took place mainly in the central areas of the island. Not surprisingly, in 1827 whites represented 59% of the population in the central departments whereas in the eastern provinces they represented 36% (Naranjo Orovio 2009, pp. 37–38). Prior to the increase in plantation agriculture in 1770, which accelerated during the period 1790 to 1820, slavery had some features that mitigated the more inhumane aspects of the institution. It has been well documented that it was feasible and not a rare event for a slave to buy his or her freedom (de la Fuente 2009, pp. 142–143). For instance, 80% of freed slaves bought their freedom during the period 1700–1770 (the other 20% were released by their masters) and free non-whites constituted about 20% of the population during this period. Of the freed slaves in 1690–1694, 79% were criollos (born in the island) as opposed to African. Women were able to buy their freedom in greater proportion than men, despite their inferiority in terms of numbers, and at earlier ages. For example, the average age of women at manumission was 24 years compared to 37 for men in the 17th century and 42 years and 48, respectively, in the 18th century. Two important reasons for these differences in slavery prior to 1790 lie in the structure of the Cuban economy and in the nature of the plantation system. Cuba’s main economic activities were not dominated by a plantation system until the end of the 18th century. Thus, slaves could even work on their own as long as they paid a daily fee (jornal) to the slave owner. In the cities this gave rise to their participation in a wide variety of activities in the tertiary sector, especially among females. Even in agricultural activities such as those of cattle estates, which hardly used slaves as noted earlier, or those of tobacco farms, which were not operated as plantations and produced the main export product during most of the 18th century, the life of the slaves was less controlled by the masters (de la Fuente 2009, p. 144) than in a plantation system. Furthermore, in the plantation sector the use of large numbers of slaves, which requires greater control mechanisms, is a feature of the late 18th Century. For example, between 1750 and 1780, the average number of slaves in a Cuban sugar mill increased by 50, from an average of about 18 at mid-century (de la Fuente 2009, p. 144). Expansion of the large scale plantation system between 1790 and 1820 changes the nature of slavery in profound ways. It becomes far more difficult to buy freedom both because of the tighter control of the slaves’ labor under the large scale plantation system and because of the increase in the economic value of slaves. For instance, the cost of a bozal (a slave imported from Africa) in Cuba was estimated at 200 pesos in 1792 and at 375 pesos in 1818. Despite the increase in price, demand for slaves increased substantially due to increases in the demand for sugar. One factor that facilitates meeting this increase in demand for sugar is technological advances incorporated into sugar production industrial processes. One of them was the Jamaican train of copper cauldrons that could be heated over the same fire and at the same time and temperature. It was brought over to Cuba by French planters (Bethell 1993, Ch.1, p. 9). In any event the number of slaves in 1792 was estimated at 88,000 and in 1817 at 147,000. Perhaps more importantly in our context, the number of females went from 40,000 in 1792 to 25,000 in 1817 (Thomas 1971, p. 89). The 16–hour days in the plantations and the nature of the work favored men. Both the political rights and the civil liberties of slaves worsened during the 1790–1820 period due to their increased prevalence as the main source of plantation labor. While there was no change in the formal circumstances for slaves buying their freedom, the possibilities of doing so in practice diminished considerably for the two reasons indicated above. One symptom of the deterioration of the slaves’ situation was the decline in fertility of plantation female slaves. It was much lower than their white counterparts despite economic and sociological reasons leading to the expectation of a higher level. It even attracted the attention of foreign medical experts who were engaged to explain the disparity (Moreno Fraginals 1995, p. 175). There is no doubt about this period being one of a de-democratization process for this segment of the population. This is the case in terms of a lack of breadth and equality of rights and a lack of protection and mutually supporting obligations between the state’s agents and this segment of the population. Furthermore, the situation of the plantation slaves would not improve for several decades. Two social groups in addition to the planters’ class, however, benefitted during this period from increased political rights and civil liberties. One was free non-whites who for a long time had been able to participate in the Army and in various occupations, including teachers. For instance, during this period a substantial number of free non-whites participated in military activities on behalf of the Spanish Crown. They did so as units composed entirely of pardos y morenos (blacks and mulattos) sometimes suppressing insurrections elsewhere. Ironically, this group lost many of the privileges gained from this and prior democratizations upon the return of absolutism once the wars of independence had been settled in the mid-1820s (Moreno Fraginals 1995, pp. 179–180; Casanovas Codina 2009, pp. 176–177). An interesting illustration of their loss of protection from the state is the experience of the coartados, slaves who had paid a portion of the agreed price to become free. Around 1840 they are said to prefer to remain slaves than to become free due to the greater personal security accruing to slaves than to free non-whites (Moreno Fraginals 1995, p. 178). Another group with a similar experience was that of “peninsulares,” Spaniards residing in the island, especially those engaged in economic activities other than sugar and coffee. The reliance on monopoly control of trade by the Spanish Crown during most of the early colonial period had limited their political rights and civil liberties. The latter began to improve after the relaxation of the actual Crown trade monopolies in the last quarter of the 18th century. During the 1790–1820 period their rights were strengthened both by measures supporting the special relation between Cuba and Spain (described in the previous section) and/or the desire to retain Cuba as a colony. This aspect of democratization was the result of an attempt to diminish uncertainty about state capacity and the legitimacy of the state. As in the case of free non-whites and even the criollo planter class, however, once the independence issue was settled in the mid-1820s a de-democratization process ensued for this group in the subsequent period. In their case the driving force was also the return of absolutism and the latter’s uneasy alliance with the criollo planter class. For instance, in 1825 white criollos were exempted from military service and could travel freely as a result; “peninsulares” were not, which impeded their ability to travel to a considerable extent (Casanovas Codina 2009, pp. 176–177). Of course this decree limited the possibilities of rebellion by the criollo class. Indirectly we have already considered economic conditions during this period but it is worthwhile to be more explicit about the situation. We begin by providing evidence on the extent of economic progress between 1790 and 1820 directly. Subsequently we discuss several issues of interpretation. Sugar exports rose from an annual average of about 5,300 tons in 1760–64 to about 18,000 tons in 1790–94 and to about 62,000 tons in 1820–24 (Santamaría García 2009, p. 75). This implies a compound annual growth rate of 4.07% in the first 30 years and of 4.12% in the second 30 years. Coffee exports grew from less than 80 tons prior to 1792 to 12,000 tons by 1823 (Thomas 1971, p. 129). This implies a compound annual growth rate of 16.7% over the 30 year period. One reason for the dramatic increase in the growth of coffee exports was the Haitian rebellion between 1791 and 1804 and its consequent destruction of numerous coffee plantations, as well as of a substantial number of sugar ones. The Spanish colonial authorities viewed this rebellion as an economic opportunity. For instance, in 1792 a royal decree granted coffee an exemption from certain taxes (alcabalas and diezmos) for ten years, which was extended indefinitely (Thomas 1971, p. 129). Cuban planters also viewed the Haitian process as an economic opportunity, because it destroyed the French sugar trade, Cuba’s biggest rival in the world at the time (Thomas 1971, pp. 72–84). Some planters in the western part of Cuba, for example, burned their tobacco fields to devote the land to sugar production. Similarly, a period of innovation in the sugar industry took place spearheaded by both local planters and French immigrants from Haiti. Innovations were spurred by a sensational increase in sugar prices, relative scarcity of land and especially scarcity of slave labor. Another consequence of this opportunistic view was a far more substantial involvement of Cuban merchants in the slave trade, which had become both more profitable and less controllable by all colonial governments. Prior to this period the slave trade had been dominated by other nationalities. A couple of other aspects of economic conditions during the period 1790–1820 merit mention here. First there were substantial fluctuations during this period with respect to prices for sugar, coffee and slaves. This is not surprising given the disruptions caused by revolutions, wars and the very different attitudes, formal and informal, toward the slave trade that characterized this 30–year period. Nonetheless, it provides first-hand experience for all sectors of Cuban society with an important and recurring economic consequence of being a major participant in world trade. Second, Cuba’s fiscal situation becomes highly unusual and unique relative to prior experience. Before this period resources were generally assigned by colonial authorities to Cuba from other colonies, specifically Mexico. This was due to the structure of Spanish colonial administration, which was designed to extract taxes from countries with large indigenous populations and/or mining sectors (Coatsworth 1998). To illustrate, Cuba’s ratio of exports to tax revenues around 1800 was the highest of any of the six major countries for which these figures could be calculated at the time: Cuba, 3.33; Argentina, 2.95; Brazil, 2.85; Peru, 1.22; Chile 0.44; Mexico, 0.40 (calculated from Coatsworth 1998, Table 1.6). Interestingly, this lower level of taxation for Cuba in the early part of the period entails a potential for a higher level later once the process of becoming an export economy is completed. Since taxes on international trade are very attractive when tax administration systems are weak, because they are easier to collect than other taxes, the greater the proportion of GDP coming from the export sector the more attractive this sector becomes to be taxed. Indeed, by 1830, 70% of public revenues in Cuba were being raised through customs duties (Santamaría García 2004, Ch. 1, p. 62). The implications of economic conditions during this 30–year period for attaining independence are somewhat direct. It was very attractive to remain a colony for many. The Cuban criollo class was experiencing a low level of taxation relative to other colonies. Colonial status lowered the probability of a major re-organization of production with respect to the two main drivers of economic activity during the period (sugar and coffee), since it eliminated the need to consider the abolition of slavery. Under colonial status “peninsulares” maintained their connection with Spain and enjoyed the prosperity of the period. Free nonwhites also enjoyed this prosperity but many must have had mixed feelings about its reliance on slavery and whether or not independence would change the situation. While the slaves in plantations experienced lower welfare from the prevailing economic conditions, independence need not necessarily have implied abolition of slavery. Even in many cases when a link was made between independence and abolition, the assertion of a need for compensation muddied the waters. From the Spanish point of view, those supporting the absolute monarchy could look at potential future revenues and at the use of the “ever faithful isle” as a base of operations for continued subjugation of the other colonies. Those in favor of a constitutional monarchy or a republic would have considered those benefits, but they would have been tempered with the logical difficulty in reconciling the maintenance of slavery with limiting the absolute power of any one human being over another. Finally, this discussion of economic conditions sheds no additional light on democracy beyond what has been identified earlier in the previous two sections. On the basis of the considerations set in the previous three sections it is difficult to conclude that anyone of them, by itself, would have resulted in the differential timing between independence in Cuba and in the rest of Latin America. If we consider all of them together, however, a case can be made that the combination of all three played a significant role in contributing to this delay. First, the economic attractiveness of coffee and sugar production for export by Cuba between 1790 and 1820 must have led Cuban criollos to consider the increasingly costly possibilities for their pocketbooks of promoting and supporting an insurrection to obtain independence. Second, one of the disruptive possibilities that would have been considered was the potential abolition of slavery or of the repetition of the Haitian revolt that coincided with the beginning of this 30–year period. Finally, the development of a particularly attractive colonial situation for many criollos as a result of the substantial development of a different special relation from that of the other colonies by 1790 and its subsequent strengthening must have also influenced any benefit-cost analysis of a potential insurrection. Incidentally, another argument against the premier role in the delay of any single one of these three factors is that each of them played a far lesser role in the case of Puerto Rico and the latter also remained a colony. Whatever the weights of these different factors in determining the delay, it is indirectly suggested by recent economic historiography that such delay may have increased the economic welfare of most members of Cuban society, except for plantation slaves. In a recent paper arguing that Latin America’s economic performance during the period 1820–1870 was not as dismal as implied by earlier research, Cuba’s rate of growth of GDP per capita during this 50 year period is estimated to be 0.7%. This compares favorably with the average for the eight Latin American countries considered (including Cuba), which is estimated to be 0.5% (Prados de la Escosura 2009, Table 6). A number of reasons are suggested by Prados de la Escosura for a negative economic impact of independence. For instance, imperfect replacement of previous administrative structures can lower public good provision. Similarly, duplication of functions previously performed centrally by the colonial government could increase costs of providing the same level of public goods. A more factual reason was the waste of human and material resources due to post independence wars among the new independent units. Ironically, a window of opportunity for Cuba’s independence seems to have closed rather quickly after 1820. A brief period during 1820–1823, called “El Trienio” led to a second Cortes de Cádiz with Cuban representation. One of the Cuban deputies, Félix Varela, even advocated the abolition of slavery. This brief democratization episode came to a halt with the return of absolutism in Spain in 1823, Varela went into exile in the U.S., and the island experienced the beginning of an increasingly repressive dictatorship as a colony for the next several decades (Thomas 1971, pp. 103–105). The international environment cemented this process and Cuba’s status as a colony (Opatrný 2009, pp. 239–241). For example, the U.S. issued the Monroe doctrine in 1823; its author, John Quincy Adams, spoke of a Cuba policy in gravitational terms of eventual attraction to the U.S. Britain began its own special relation with the U.S. by agreeing to the doctrine and not challenging Spain’s right to its remaining colonies. Even Bolívar was willing to settle for Cuba and Puerto Rico in the hands of Spain as long as it recognized Colombia and accepted peace. Varela rejected Cuba’s annexation to Colombia or Mexico from his U.S. exile. Finally, this 30–year period illustrates the complex relations between democracy’s dimensions and independence. Periods of increased civil liberties under absolutism were sometimes accompanied by decreased political rights and sometimes not, depending on state capacity and perceptions of legitimacy. Periods of increased political rights under a constitutional monarchy were accompanied by a lowering of the political and civil liberties of a substantial segment of the population, namely plantation slaves, which in turn undermined the legitimacy of the constitutional monarchy. An alternative but related view of democracy (North, Wallis and Weingast, 2009) is that of an evolution toward competition (open access systems) in the economic and political/legal realm. From this perspective, this 30–year period in Cuban history moved society toward democracy through increased competition in the economic realm while experiencing pronounced advances and setbacks in the political/legal realm. No matter how democratization gains are defined, however, the basic outcome of this turbulent and important historical period was that the substantial and increasing lack of legitimacy of slavery as an institution profoundly impaired Cuba’s subsequent democratization. 1. I would like to thank Mauricio Font and Silvia Pedraza for their comments at the ASCE session. I am also grateful to Carlos Quijano and John Devereux for detailed written comments after the meetings. While I was not able to incorporate all of them fully in this version, usually due to constraints of various types, the paper was certainly improved by them. Of course, any remaining errors or misinterpretations are my own. Professor Roger R. Betancourt received his PhD from the University of Wisconsin in 1970. He joined the Faculty at Maryland in 1969 and became Emeritus in 2007. Among his main accomplishments at Maryland he would highlight Ph. D. dissertation advising. He is the first recipient in the Economics Department of the Mentorship Award from the Division of Behavioral and Social Sciences for this activity. His former students have raised funds to endow a Fellowship in Applied Economics recognizing this activity. The first Fellowship was awarded during the 2010-2011 academic year. While professor Betancourt no longer has any standard teaching or administrative duties at Maryland, he continues engaged in research on a regular basis as well as advising on a selective one.